Obituary for Charles "Charlie" Joseph Reinhardt | Bowerman Funeral Home, Inc.
Charles “Charlie” Joseph Reinhardt, age 89, of Trenary, died on Wednesday, July 25, 2018 at the Pinecrest Medical Care Facility in Powers, Michigan. He was born the oldest of seven children on April 2, 1929 in Detroit, Michigan to Cecil and Cecile (Tremblay) Reinhardt. Charlie grew up in Detroit and graduated from Cass Tech High School. He worked for Vickers and then served in the U.S. Army from 1950 until 1952 as a radar man with the 235th field artillery observation battalion. After Korea, Charlie went back to Vickers and then got an electrician’s apprenticeship with the City of Detroit at Mistersky Power Plant. Charlie married Elaine Mary Burkman and together they raised their two children. He retired from the Wayne County Road Commission Airport Division where he was an electrician for twenty years. After retirement, Elaine put Charlie back to work so he would get out of her way and he spent two summers on the steamboat at Greenfield Village. In 1988, they moved to the Upper Peninsula and in 1990, they made Trenary their home. Charlie’s Catholic faith was important to him and while down state, he was a member of St. Monica, St. Christine, St. Raphael, and Sts. Simon and Jude Catholic Church. When they moved to Trenary, he became a member of St. Rita and on November 6, 2002, Charlie was professed a Lay Franciscan, St. Anthony of Padua Fraternity. 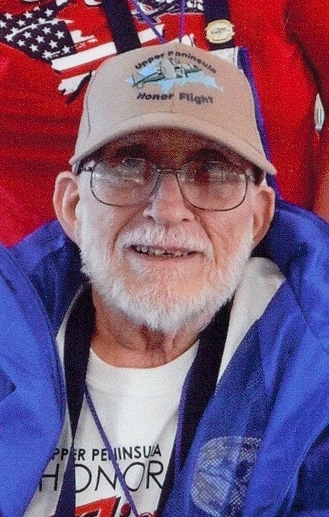 He was also a member of the American Legion, V.F.W., and D.A.V., and Charlie was on the Mission VII Honor Flight in 2014. He enjoyed camping, boating, model trains, travelling throughout the U.S. and visiting historic sites and museums, and also attending 235th Battalion reunions. Charlie is survived by his wife of over fifty-six years – Elaine Reinhardt of Trenary; children – Linda Reinhardt of Trenary and Richard (Julie) Reinhardt of Plainwell, MI; grandson – Aiden Reinhardt; sister – Mary Vickroy of Allen Park, MI; and numerous nieces and nephews. He was preceded in death by his parents and brothers – John, James, Robert, and Bruce Reinhardt; and sister Ann Petroni. Visitation will be held at the Bowerman Funeral Home in Munising on Friday evening from 5:00 until 8:00 p.m. The Franciscans of St. Anthony of Padua Fraternity will lead a prayer service at 7:00 p.m. There will also be visitation at St. Rita Church in Trenary on Saturday, August 4, 2018 from 10:00 a.m. until 11:00 a.m. Fr. Joseph Vandanoor will celebrate Charlie’s Mass of Christian Burial at 11:00 a.m. Interment will be at the Mathias Township Cemetery in Trenary where military honors will be conducted by the American Legion, VFW, DAV and members of the National Guard.